Triumph World is written for the Triumph enthusiasts – all makes and models, from the TR series, Vitesse, Spitfire, GT 6, Stag and saloons, and especially the beloved Standards. Each issue features full-color pictures of the cars, news, interviews, technical assistance, and memories of days gone by and captures the Triumph scene worldwide. The profiles one of the TR sports models of the Spitfire, or saloons in each issue. Get exclusive black and white photographs to remind you of the glorious past, along with colorful pictures of the modern owner’s collection. In the market to purchase a Triumph? The Buying Guide will provide you with information on getting the best deal for your money. With tips from collectors and experts, learn how to pick out the one for you. Learn where and how to choose a model, how to insure the car, and how to maintain it. Join a Triumph club. Read the club forum to get information on a club near you. Get with others that share the same interests. Make friends with other Triumph owners. Get information on dues, news, and the next meeting. Get involved with making a difference in the Triumph world. Get advice on maintaining your Triumph. Receive mechanical assistance for keeping the engine running smoothly, where to purchase car parts, and how to install them. Get practical suggestions for upkeep to ensure your classic vehicle remains in top form! Each issue includes information on the next show and competition. See the gorgeous vehicles of the collectors in an event that will make you drool. Talk to the collectors, those selling, and those buying. Catch the excitement of owning a Triumph! 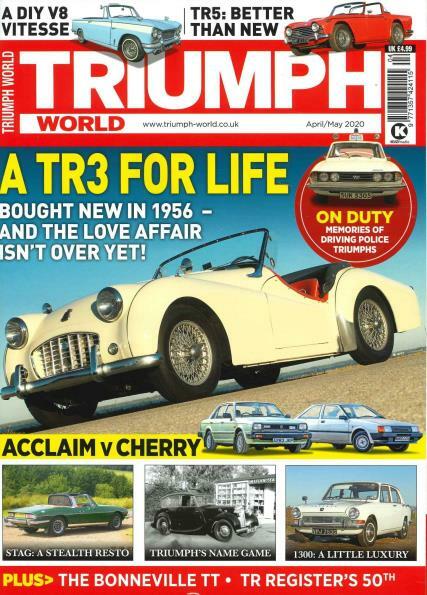 Triumph World magazine is the one for you. With interviews, classic car news, automobilia, and advice, you don’t want to miss a single issue.